Are your horse’s teeth bothering him? Here are some common signs to watch for. Equine injuries such as wounds or soft tissue swellings are typically easy to recognize. Problems that aren’t visible to the eye, however, can go unnoticed. Take dental issues, for example. These often go undetected because the cheek teeth can’t be readily seen and are dangerous to examine without proper equipment. There are some subtle clinical signs, however, that can alert the owner about a dental or mouth problem, so it’s important he or she be on the lookout for those and schedule routine dental exams. 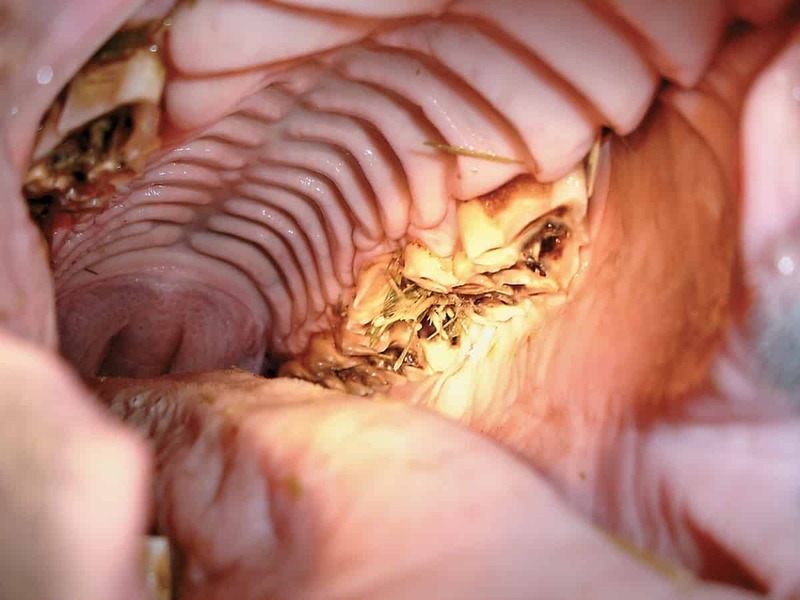 A full examination requires sedating the horse, keeping his mouth open with a speculum, and using a strong light source and a dental mirror to visualize all of the cheek teeth. It also involves manually checking for loose teeth or other issues. Some conditions are unique to either the growing or geriatric horse, while others can occur at any age. The following are the most commonly seen signs of dental problems and their possible causes. Dropping feed Sharp enamel points from normal chewing wear can cause a normally fastidious horse to change how he eats, resulting in dropped feed. Other causes might include loose or fractured teeth, periodontal disease, malocclusions, foreign bodies, and masses in the mouth. Many horses normally drop feed if they look around while eating or if they are fast eaters. Suddenly not eating either hay or grain In horses younger than 5, pain before, during, or after losing a baby tooth can make chewing unpleasant and difficult. In horses older than 20, loose teeth can make chewing difficult. Dropping clumps of hay (quidding) This can be secondary to pain from sharp enamel points in any age horse, for example, or in older horses it can be a result of decreased chewing surface area that occurs naturally with age. Eating with the head tilted to one side Mouth pain, such as from sharp enamel points on one side of the mouth might cause the horse to try to adjust his eating pattern by turning or tilting his head. Salivating more than normal The horse’s body might increase saliva production in an attempt to lubricate something sharp or possibly make it easier to chew and swallow his feed, again in response to pain. Losing weight This can potentially occur at any age due to a dental or mouth problem. The most common clinical cases of weight loss involve aged horses that are unable to eat long-stem hay because of diminished grinding capacity. Fussy with the bridle; resistant on one side more than another Pain within the mouth can cause the horse to react negatively when asked to work. Soft or hard asymmetric swellings Young horses can develop normal symmetric bony swellings, called eruption cysts, in response to the eruption (emergence) of the cheek teeth. If the swellings are asymmetric or the horse reacts with pain on palpation, then consider them -abnormal. One-sided nasal discharge with an odor Up to four of the six upper cheek teeth communicate with (are connected to) the sinuses within the horse’s head. Abscessation of any of these teeth can lead to a secondary sinus infection. Discharge from the infected sinus will drain out the nostril. It is usually yellow and has an odor you might be able to smell as soon as you walk into the barn or stall. Mouth odor Mouth odor comes from food packed between cheek teeth or fractured tooth fragments. A horse owner can detect these signs easily by routinely checking his or her horse’s head for any abnormalities and watching the animal eat. Regular dental examinations performed by a veterinarian will also alert the owner of any problems to be watching for. Previous PostPrevious Could a Supplement Help Reduce Horse Insulin Concentrations?